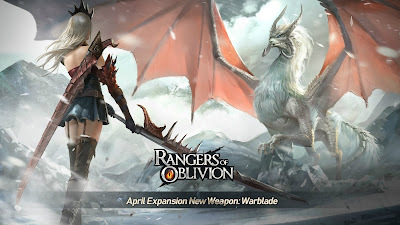 Rangers of Oblivion invites you to join the Rangers, a fearsome faction of monster-hunting masters sworn to defend the land of Malheim; a sprawling 3D fantasy world offering a huge range of quests that test your tracking, combat, treasure-hunting and survival skills. As any seasoned Rangers of Oblivion player will tell you, your weapon of choice requires careful consideration: with greatswords, lances, longbows, twin blades, staffs and armoured gauntlets all available. Each weapon has a distinct combat style, skill set and offers different attributes. You can forge stronger weapons and armour by crafting from the spoils of the hunt, upgrading weapons to help you face the more fearsome of Malheim’s monsters. The Warblade, however, is not a weapon native to Malheim — with its origins in the eastern kingdom far beyond the wilderness. It was brought to the Rangers by a mysterious and powerful swordsman, whose own distant kingdom was also plagued by behemoths. There, the Warblade became an invaluable weapon in defence of their realm; used by a band of warriors, a strike made in unison can cut down even the most gargantuan monsters. Gripped in both hands, a variety of hack, slash and lunge combinations are possible, giving both power and speed to the user's attacks. However, the wielder of a Warblade must be able to channel their Ki; an inner force that grows steadily in the heat of battle. Proficient Warblade users can strike with deadly finesse. Mastering the tempo of combat by honing their Ki is something any Ranger opting for a Warblade should aim to achieve. Rangers of Oblivion is the ultimate monster-hunting playground for mobile devices. Want a Warblade? Head on over to the GTarcade site and download Rangers of Oblivion.